I’m getting antsy. I can’t wait to share our latest endeavor with everyone but it’s still in production at Discmakers. It took longer than I expected to get the colors right on the disc. We’ll still make the May 1st release date. 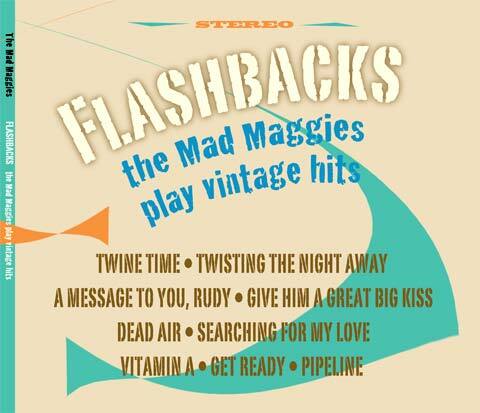 But meanwhile I’m so excited about it that I just want you, our friends and fans, to get a sneak peek of and listen to “FLASHBACKS the Mad Maggies play vintage hits“. So here ya go, two tunes to download and share and also our liner notes and some album artwork. We had big fun dipping into the past for these gems. Listen to ’em loud! FLASHBACKS…So much going on. So much good music. 1961 JFK takes office. The Berlin wall is built. The first man makes it to space and he happens to be a Russian. The Twist dance craze is in full swing. In December, in Hollywood, California Sam Cooke records Twisting the Night Away. The tune rises high in the charts the following year. 1962 In Southern California, five Santa Ana high-schoolers form a band called The Chantays. They write and record, Pipeline which rides the wave to become one of the most recorded surf-rock tunes of all time. Jamaica wins independence. The ska dance scene is hopping and Jamaican trumpeter Baba Brooks is busy writing, arranging and playing at the center of the action with the likes of Duke Reid and Byron Lee. 1965 Brooks releases Vitamin A on Treasure Isle Records. Watts riots in Los Angeles. New York teen pop sensation, the Shangri-Las have a string of successful singles including Give Him a Great Big Kiss written and produced by George “Shadow” Morton. Chicago soul artists, Alvin Cash and the Crawlers hit it big with the dance tune Twine Time on Mar-V-Lus Records. Nat King Cole and Spike Jones die. Björk is born. Smokey Robinson writes and produces Get Ready for the Temptations at Hitsville USA aka Motown Records in Detroit, Michigan. The tune will have more success later when the rock band Rare Earth records it in the early seventies. 1966 In Alabama, Bobby Moore and the Rhythm Aces sign with the Chess Records subsidiary, Checker Records and record their first single, Searching for My Love at Fame Studios. This R&B smash hit featuring the soul-filled vocals by guitarist and singer Chico Jenkins sells a million copies. The Star Trek series premieres. The Vietnam War keeps escalating. 1967 Singer Dandy Livingstone, a native of Kingston, Jamaica but living in London since his teens, signs with Ska Beat records and releases Rudy, A Message to You. A dozen years later The Specials open their debut album with Dandy’s tune. An energy crisis. Several recessions. Several wars. 1986 Inspired by real life events and the retro sounds of a cappella doo-wop Maggie Martin writes Dead Air. She includes the tune in the Mixed Company theater show “Touchdance”. 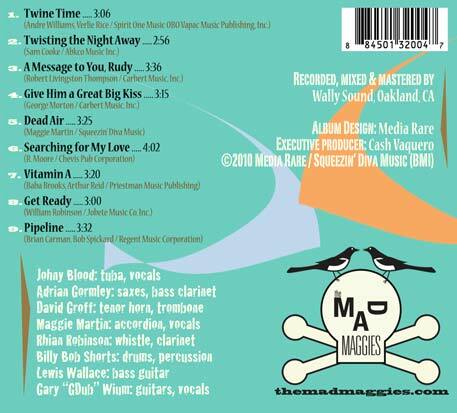 2010 In February in Oakland, California at the Wally Sound studio eight Mad Maggies record these nine tunes from the past. So much going on. So much more good music. 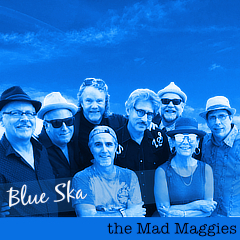 dance, Flashbacks, Give Him A Great Big Kiss, the mad maggies, Twine Time, vintage hits, Wally Sound.